Approximately 1 in 4 people experience mental health issues every year, with about 6 out of 100 people being diagnosed with Generalised Anxiety Disorder. The fact that this is so common means we really need to do something to address this issue and as always, look for the underlying cause. There’s usually a tendency to focus on neurotransmitters as being the problem with mental health issues, but what if there was more going on in the body that could be contributing to symptoms? There is a huge link between the gut and brain, with studies showing that a general altering of the gut microbiome can have a huge impact on mental wellbeing. Issues in the gut can range from anything from inflammation to SIBO, parasites to yeast, and a general overgrowth in the “bad” bacteria. This can subsequently cause widespread inflammation, eventually affecting the brain. Serotonin, the happy hormone is also made in huge quantities in the gut, so when things aren’t functioning optimally, the happy hormone doesn’t get where it needs to. 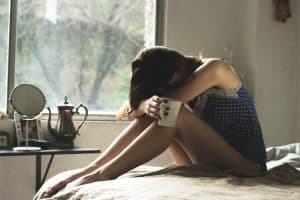 People with the IBS diagnosis quite often present with anxious or depressive symptoms and more often than not when stool test results come back, there is a pathogen present that needs to be dealt with. It’s also worth noting that food intolerances can generate a level of inflammation in the body, again affecting the brain’s ability to do its thing! The HPA axis is essentially the pathway of stress in our brain, down to our adrenal glands. When this is activated for a prolonged period time, cortisol can become dysfunctional and it can create a state of inflammation, by which the brain is once again affected. Progesterone, DHEA and pregnenalone are also affected, which can in turn alter our neurotransmitters, especially GABA, which keeps our brain calm. Similarly, if the ratio of progesterone to oestrogen is off (too much or too little oestrogen), GABA gets challenged and anxiety is the result. You also want to keep a close eye on your thyroid, as anxiety can be an indicator that something isn’t quite right with this little gland. Additionally, insulin, the hormone that controls blood sugar, can affect mood, so keeping a check on this and your sugar intake is vital. Key nutrients involved in mental health are magnesium, B vitamins (including folate and B12), zinc, DHA, EPA and vitamin D, so when these are low, our mood can be negatively impacted. Sometimes adding in a good quality multi vitamin and fish oil can correct these deficiencies, but if they persist it may be worth venturing back to digestion to assess if proper absorption is occurring. Medications can also affect nutrient status, including the commonly prescribed proton pump inhibitors (PPIs), or the contraceptive pill. As with any symptom, the trick is to always go further back down the line and assess what may have been the physiological trigger. Whilst of course nutrition is not the only thing to look at when it comes to mental health, it can certainly play a vital role, especially when combined with functional medicine. If you have anxiety and would like support and/or functional testing, please don’t hesitate to get in touch!